The Plinthios Brokhos as described by Greek physician Heraklas, a sling for the binding of fractured jaws. Preserved in republication by Oribasius. Oribasius or Oreibasius (Greek: Ὀρειβάσιος; c. 320 – 403) was a Greek medical writer and the personal physician of the Roman emperor Julian the Apostate. He studied at Alexandria under physician Zeno of Cyprus before joining Julian’s retinue. He was involved in Julian’s coronation in 361, and remained with the emperor until Julian’s death in 363. In the wake of this event, Oribasius was banished to foreign courts for a time, but was later recalled by the emperor Valens. Oribasius’s major works, written at the behest of Julian, are two collections of excerpts from the writings of earlier medical scholars, a collection of excerpts from Galen and the Medical Collections (Ἰατρικαὶ Συναγωγαί, Iatrikai Synagogai; Latin: Collectiones medicae, a massive compilation of excerpts from other medical writers of the ancient world. The first of these works is entirely lost, and only 25 of the 70 (or 72) books of the Collectiones survive. This work preserves a number of excerpts from older writers whose writings have otherwise been lost, and has thus been valuable to modern scholars. The earliest known description of a string figure, presented as the surgical sling Plinthios Brokhos by Greek physician Heraklas, is among the preserved material. nor the speaking well. The speaking water has dried out. ^ Miller, Lawrence G. (1945). “The Earliest (?) 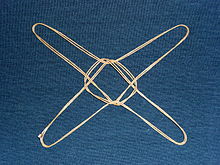 Description of a String Figure”. American Anthropologist. New Series. 47 (3): 461–462. doi:10.1525/aa.1945.47.3.02a00190. ^ Day, Cyrus L. (1967). Quipus and Witches’ Knots. Lawrence, Kansas: University of Kansas Press. pp. 86–89, 124–126. Thompson, E.A. “The Last Delphic Oracle.” CQ 40.1 (1946): 35-6.